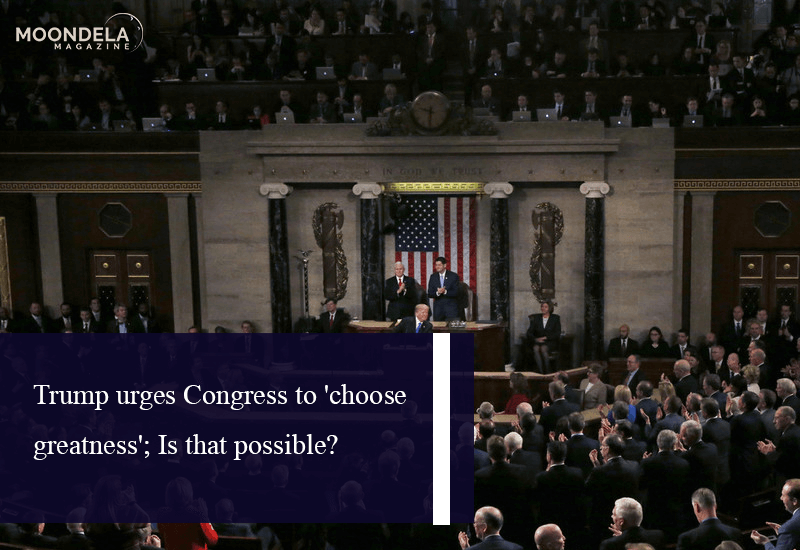 Trump urges Congress to 'choose greatness'; Is that possible? In his next State of the Union speech, President Donald Trump dared Congress and America to ‘choose greatness’ over identity politics and branches. Despite moments of bipartisan unity, such a future looks improbable. “We must choose between greatness or gridlock, results or resistance, eyesight or vengeance, incredible advancement or unnecessary destruction. Tonight, I ask you to pick greatness,” Trump said at the beginning of his speech on Tuesday evening, which functioned at nearly 90 minutes. Though everyone applauded his line that “success isn’t winning for our celebration, victory is winning for our nation,” as the address went on Trump made it clear that he thought his policies — not Democrat or Republican — were the correct ones. The president really made a number of overtures to Democrats. Since he painted an image of a rising market, with production jobs coming, countless lifted from welfare and the lowest unemployment, the line about women entering the workforce in record numbers — such as in Congress — got him a rare standing ovation as well as a little celebratory dance in the female Democrats, dressed in white. He also praised the bipartisan effort to reform national prisons and agreed with the frequent Democrat talking point about criminal justice often being unfair to African-Americans. Two of the guests at the gallery were ex-convicts Alice Johnson and Matthew Charles, equally black. He talked health care, from lowering drug prices and protecting pre-existing ailments to eradicating AIDS within 10 years and funding research to battle childhood cancers. Trump also dug in, however, on the problems he thought of paramount importance, calling out Democrats for encouraging last-moment abortions — and right after obtaining cheers and applause from them for endorsing paid family leave. Stony silence in the Democrats approached his oath to construct a wall on the border with Mexico, too. Repeating the facts and figures he frequently invoked through the shutdown battle, Trump also resorted to emotional rhetoric, contrasting the wealthy that call for open borders “while living their lives behind walls and gates, and guards” to the working class that has to cope with all the effects of illegal immigration, from reduced wages and crime to crowded schools and schools, as well as the fraying safety net. The same rhetorical suggestion was utilized to divert from condemning Iran for threatening “genocide against the Jewish people” to praising the Pittsburgh police officer who charged to the Tree of Life Synagogue to stop the shooter who’d killed 11 there, and one of those survivors of that shooting, who had lived through the Holocaust.